Our team would like to express our deepest gratitude for your cooperation and support! We congratulate all of you on our common achievement! Add social media links to your profile – expand your audience! 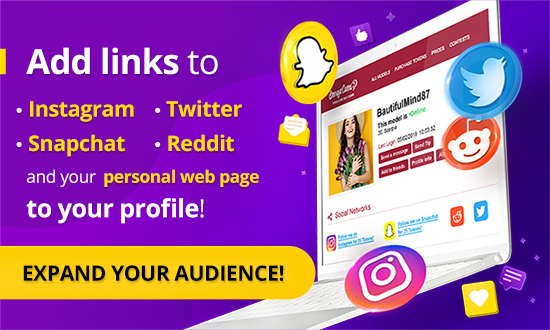 Now, you can add your Instagram, Twitter, Snapchat, Reddit and personal website links right to your BongaCams profile. To do so, simply select My Profile > Social Networks, in the menu. Shortly, social media icons will also appear on the preview window of your stream on BongaCams homepage, which will attract even more attention from members. Add social media links right now – increase your revenue!